The short life and career of Janis Joplin hardly detracts from her recognition of having one of the most beautiful voices in the history of music. Her Woodstock performance was described as strong, but did little to fully display the talent of the troubled muse. Born in 1943 and sharing the curse of Jimi Hendrix and Jim Morrison of early death as a result of drug use , the Texas born singer’s career exploded when she drew the attention of psychedelic rock band Big Brother and the Holding Company. After breaking away from Big Brother, Joplin launched a solo career which consisted of a new backup group called the Kozmic Blues Band. Although the newly formed band’s release did not match the popularity of Big Brother’s “Cheap Thrills”, the band did appear at Woodstock. Unfortunately, Joplin’s shaky physical state during the performance stemming from her heroin addiction and a ten hour wait after arrival created a poor performance which was not included in the documentary; although the director’s cut includes her performance of “Work me, Lord”. The Kozmic Blues Band broke up after their performance at Madison Square Garden soon after Woodstock 1969. Drifting in and out of heroin addiction, Joplin was involved in another project known as Full Tilt Boogie Band; the group she gave her last performance with. The band received mostly good reviews from fans and critics alike. After her death in 1970 from a heroin overdose, Full Tilt Boogie Band released its first album titled “Pearl” which became Joplin’s biggest selling album. 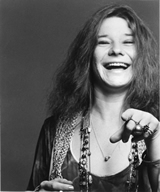 Joplin remains an icon for female singers as breaking through in a male dominated blues scene. She is listed as number 46 on Rolling Stone’s list of greatest artists as well as number 28 on their list of greatest singers. Aside from her music legacy, her rebellious style is recognized in some artistic circles as being highly influential even to this day. Since her death, Joplin’s albums have gone gold, platinum, and triple-platinum; Joplin was inducted into the Rock and Roll Hall of Fame in 1995.